Georgia Southern’s New Motto? Win. Statesboro – After taking over Georgia Southern in an interim role the second-half of last year, Chad Lunsford’s spring focus, for the Eagles, has been on their foundation. Though his team found some momentum last November, winning consecutive games down the home stretch, Lunsford’s program is now coming together in his image. Georgia Southern is one of college football’s most-remarkable stories, with expectations don’t that change. The approach, this off-season, has been on the basics, laying the groundwork for future flags in the sky. In honoring and continuing what was, Lunsford and his staff are making sure that the current crop of Eagles are in-tune with what is. Right now, there is a fixed frame of reference in Statesboro, one of getting better each day. 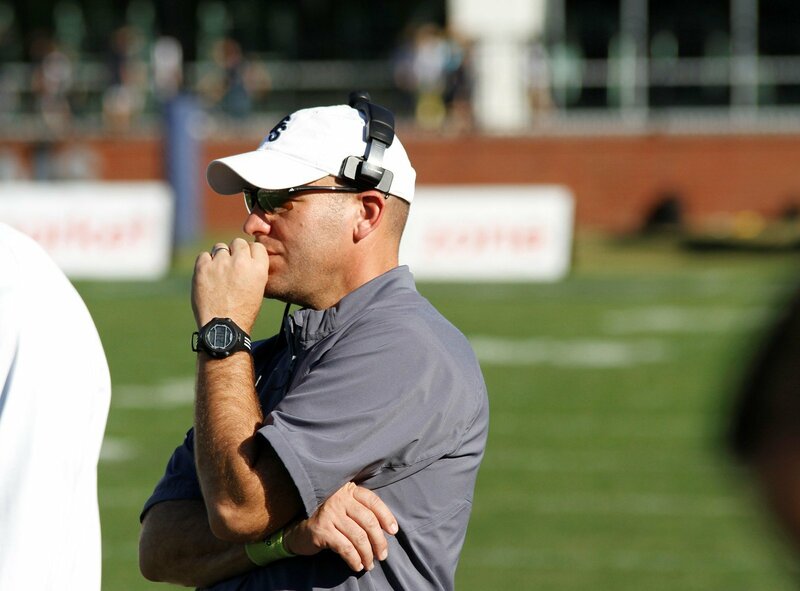 Though Lunsford has been a Georgia Southern fixture, on staff from 2003-2005 and from 2013 on, there has been a transition in his role from assistant to interim to head coach. Turnover and staff additions have come with some new concepts and schemes, but the approach, this spring, has been quite deliberate. Fittingly, the basics have been the beginning. Instead of rushing into a dramatic overhaul, Lunsford has made sure the Eagles have a firm footing in place; from there, a sprint forward can get off to a better start. Within spring workouts, points of emphasis have obviously emerged. Competition has been the most consistent revelation. Given the fluid depth chart, chances at playing time later this year are very much up grabs; across the board, players have responded. Opportunity has been the ultimate motivator. Lunsford has seen improvement at the line of scrimmage and in the defensive backfield, while also keeping a close eye on his talented group of signal callers. Practice has been a spring mix of education and excitement as, underlying everything Lunsford does, an upbeat optimism has been Georgia Southern’s push forward. While skills are being honed, an attitude is being developed and a culture is being established. The Eagles aren’t just learning and listening, they are, as importantly, believing. Lunsford’s message continues to resonate. After a chaotic season, the off-season now comes with stability. There has been a meaningful intensity throughout workouts and drills, efforts that provide traction ahead of all that lies ahead. Consistency in the spring can oftentimes result in consistency in the fall. So far, the right tone is being set, current persistence that may play a very real role in later production. From Lunsford to his coordinators and assistants and the rest of the staff, the Georgia Southern message has been constant and clear. That positive reinforcement has been echoed all throughout the facility, creating a program-wide emphasis on success. More is the measure for each and every player. Already, Lunsford is seeing the benefit, results he attributes to coaches on the field and off. “It starts from the top, but, man, our strength coach Matt Greenhalgh has done a tremendous job with our guys in the off-season, getting them ready for spring ball. The guys came out with the juice and our coaching staff has done a good job of keeping them and helping them sustain that energy level. There’s a real positive vibe between our players, between our coaches and I think that is important going into the fall. Furthermore, the team has benefited greatly from the addition of program legend Adrian Peterson, a College Football Hall of Famer and eight-year NFL veteran, hired as Georgia Southern football’s Director of Student-Athlete Development in February. Peterson is the all-time leading rusher in NCAA Division I history, was a four-time All-American, won the 1999 Walter Payton Award and two national championships. He has also become a published author, renowned speaker and an advocate through his tireless philanthropic work. What has been a promising spring session will close with Saturday afternoon’s intra-squad game at Paulson Stadium. Given the circumstances, Lunsford is opting for more of a scripted scrimmage. The plan is for more direct and specific observation, all with the goal of identifying strengths and weaknesses in a controlled environment. Georgia Southern coaches will be quick to take notes. This weekend, the Eagles’ concentration and efficiency are set to be tested in a variety of different scenarios: goaline to two-minute and all else in-between. The plan is to present players with more than just situations that may come up in an average individual game, but potentially others that may not as well. “A lot of times you actually draft teams, I don’t think that is what’s right for us this year. We’re going to use this opportunity so we can get more evaluation on guys, so we will see an offensive vs defense type of game instead of a blue team vs a white team,” Lunsford explained. Even before Saturday’s scrimmage, spring, for Georgia Southern, has been a time of growth and a sign of things to come. The commitment to a cause has been real; correspondingly, so, too, has the progress. Georgia Southern’s season starts on September 1st. The schedule, however, is long underway.